emember your New Year's resolution? Yes? No? Fear not: Senior Instructor SYDNEY MILLER is sharing simple, healthy and habit-forming challenges every month of 2017. Each one is designed to help you reach long-term goals through mini-routines. Here’s what she’s got on tap for June. This month, it's all about walking. Need more than warm weather to motivate you to get outside? Sydney teamed up with registered dietitian and Good Housekeeping Nutrition Director JACKIE LONDON to share some (science-backed!) savvy on why you should take a hike this June. 1. Walk more, burn more: Take your commute to and from SOUL to the pavement. Devoting 30 minutes a day to get outside for a stroll has been linked to optimizing weight management and a whole host of other health benefits: improved balance, brain function, heart health, and joint and muscle strength. Because those extra 30 minutes a day will help you burn just enough without throwing off your regularly scheduled cardio, you're likely to benefit from a little extra burn without feeling hungrier. 2. Take work breaks: Who says 30 minutes has to mean 30 minutes straight? Get up and take a ten minute walk three times a day during the work week (yes, we can all do this — we're guilty of spending 10 minutes, three times a day exploring new Snapchat filters and Instagram stories, right!?). It'll help keep you focused without committing to too long of a break (or spending too much time sitting down!). 3. Kill cravings: So often, we fall victim to the feelings that make us want to snack, especially on the sweet stuff. Getting up for a walk can often put hunger cues on pause, giving you time to figure out if you're actually hungry, or just bored, tired, or feeling a little low. 4. Check out a new playlist: Use walking time to download new music — especially #sydsquad playlists via Spotify! Adding new music to your daily routine helps keep you motivated and can boost your mood and heart rate. 5. Learn something: Podcasts are a great way to get the news, learn a new skill, or just hear a great story. Tuning in to an episode as you walk can help you maximize the time you spend outside by multitasking it as "reading time." Explore based on topic via iTunes. 6. Get to 10k: The number 10,000 isn't arbitrary — taking 10,000 daily steps has been linked to better overall health, including lower waist circumference, improved heart and brain functionality, and boosted immunity. This number may feel like a lot at first, so start small by getting in your 10-minute walking breaks, walk an extra few blocks to grab groceries on your way home from work, or switch up a quick ride (taxi, train, bus) with a quickie walk to help you get closer to this goal over time. 7. Phone a friend: ...or your mom, grandparents, friends across the country or overseas — you name it! Walking is the perfect catch-up time as it gives you a chance to focus on a conversation while getting out into some sunshine. 8. Zen out: Walking = meditation on wheels (need way say more?). Keep your playlists and podcasts in rotation, but also consider an occasional tech-detox on your walk. It may be short, but it can help you get (and stay!) centered all day. 9. Do errands: A walk can double as your getting-sh*t-done time. Pick something you might order online and go outside to pick it up by foot (how old school!). It'll help you log extra mileage and improve your health, while also feeling like you accomplished something necessary. 10. Explore: Taking a few laps around a local farmers market on the weekend can help you make a habit out of walking more frequently, and getting to know a new neighborhood is easiest by foot (since you'll have to retrace steps to get back!). Use this as an opportunity to grab a friend and get out of your usual routine. 11. Grab a buddy: And on that note, walking = the new cocktails (or maybe you're just walking to get cocktails?!). Catch up with friends by foot to kick this healthier habit into high gear. 12. Get some serotonin: Otherwise known as the happy hormone, endorphins released during walking can help you chill out and feel happier. Combine that with some summer sun and start smiling. 13. Escape the air-conditioning: Staying indoors when temps soar outside can make the office downright frozen. Escape over air-conditioned offices and get outside for a quick walk and coworker catch-up — it'll help you reset midday and warm up from the pumping cold air! 14. Save some cash: Whether you're catching a cab, ordering a car, or swiping your metro card, transportation can be a cash-killer. Grab the opportunity to commute with your own two feet. Finding ways to make this a habit will help you stay cash-positive all summer long. 15. Find your (new) soul: Walking to class may seem like double the work, but it can actually help you get in the zone and get ready to sweat. Consider our June challenge your new warm-up! Stay in touch and come walk with us! Ask questions or just say hi: @sydmiller and @jaclynlondonrd. 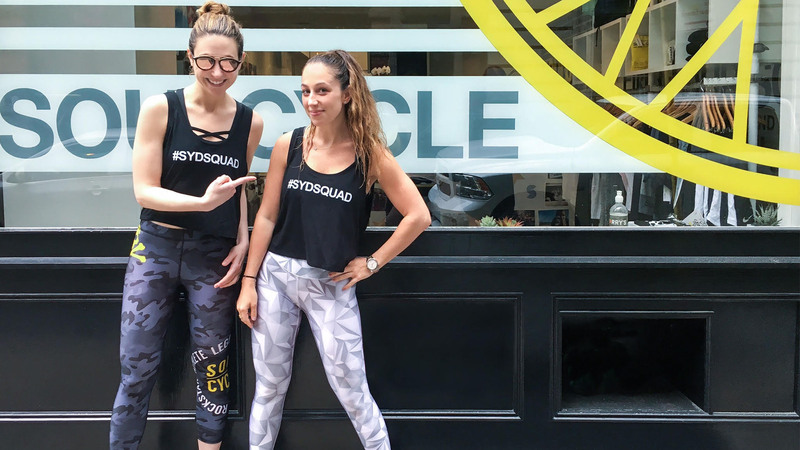 Catch classes with SYDNEY at 19th Street, Bryant Park and Union Square. Want to ride? Click HERE to grab a series.